It has finally stopped snowing here in Antarctica Central New York, and a hopeful runner can almost be tricked into thinking that spring is finally on the way! And with spring, of course, comes outdoor track season (to be fair, that's actually been underway for a couple weeks, but bear with me here, because it finally feels like outdoor season, not indoor...at least until the next snowfall). And what shoe enthusiast can think of track season without thinking of spikes? Not this shoe geek, no sir, I think I've made my love of spikes well known. This track season, my weapon of choice has been the Brooks The Wire 2. The Wire 2 is a lightweight distance spike from Brooks. This shoe is intended for serious athletes competing in mile to 10k events. The Wire has a curved shape. BioMoGo is Brook's premium midsole material. BioMoGo is designed to offer resilient cushioning and extends the full length of the midsole. BioMoGo is also environmentally friendly, as it will biodegrade 50 times faster in a landfill compared to traditional foam midsoles. Ultra Lightweight Mesh secures your foot without adding weight. Synthetic Overlays are strategically located with the purpose of providing a secure fit. Minimal Tongue Construction used to reduce weight and create a custom fit. Welded-No-Sew Forefoot Capture holds onto your foot without the irritation from sewed overlays. Strobel Last utilizes a full length layer of foam to provide cushioning and flexibility. Pebax Renew Distance Plate is utilized in the forefoot and is a polymer based plate engineered for flexibility and power transfer. Shark Skin is located in the heel and midfoot and is a textured thermoplastic designed for additional traction. Contains 5 spike receptacles per shoe. Let's start with a quick primer on different types of spikes. Cross-country spikes have a rubberized sole with both metal spikes and rubber mini-lugs for running over varied terrain, including grass, dirt, mud, and rocks. 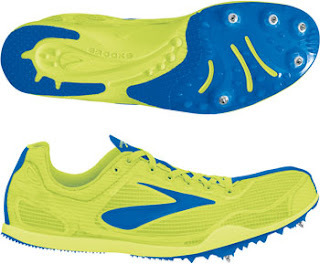 The Brooks Mach 13 (that's the spikeless Mach in the review; the spike has receptacles for metal spikes) and Nike Zoom Kennedy XC (replaced by Victory XC) are examples of XC spikes. While XC spikes can be used on the track, dedicated track spikes, which include distance, mid-distance, and sprint spikes, are usually lighter, less cushioned, stiffer, and have a plastic sole. Distance spikes are less aggressive than middle distance spikes, which are built to keep runners on their toes, having even less cushioning in the heel and being a little stiffer for added response and "pop." However, many long-distance runners who prefer more aggressive spikes wear mid-distance spikes for long-distance events, a prime example being the widespread use of the Nike Zoom Victory, one of the more popular spikes I see at track meets. Many of the bright yellow "volt" shoes that you saw at the London Olympics were some form of Victory, as are the shoes you see runners wearing at track meets that are a different color for each foot (though occasionally I see the Zoom Matumbo too, a distance spike that comes in split colors). 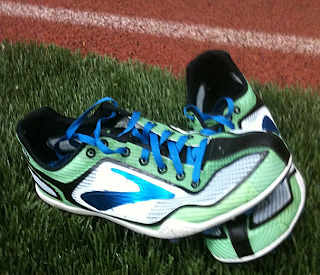 Sprint spikes are a different beast, with no real heel to speak of and an even stiffer plate. In general, each company usually offers two tiers of spikes: an entry-level spike that often costs between $50-70, and an upper-level spike that's usually closer to $100 (or more), which is generally lighter than the entry level spike. The Brooks The Wire 2 falls into the upper-level long-distance spike category. The Brooks The Wire 2 is built on a curved last and has a narrow (especially through the toebox), glove-like, performance-oriented fit. The Wire 2 uses a thin synthetic upper rather than the regular mesh-y upper that was used in older spikes. This type of upper has become fairly common in today's spikes. The upside of this type of upper is that it cuts weight and gets less waterlogged in the rain. The downside is that it tends to stretch less (so lacing them to prevent hot spots can be more finicky), and it isn't quite as comfortable as the older fabric uppers. There are no real overlays to speak of, which limits rubbing and makes them comfortable without socks. Also, the tongue is both thin (non-padded) and narrow. The thinness means you may notice the laces against your instep (so be careful not to tie them too tightly), and the narrowness cuts weight, but also has the happy side-effect of limiting tongue-slide and keeping the tongue in place. The Brooks The Wire 2 is stiff through the forefoot, due to the spike plate, but more flexible through the midfoot than I had expected (probably because I wore mid-distance spikes in college, despite being a distance runner). This makes them a little more forgiving for longer distances and doesn't force you onto your toes as much as a more aggressive spike. This means that The Wire 2 is a little less quick-feeling and and doesn't have quite as much "pop" as my old middle-distance spikes, but they're a heckuva lot nicer to my no-longer-22-year-old calves. They are, however, still a track spike, so they're still much more responsive and stiffer than most road racing flats or XC spikes, relatively speaking (when I spike up for training, 9 times out of 10 I use XC spikes, because of their increased forgiveness versus a track spike). The traction of the Brooks The Wire 2 is fantastic. The 5-spike configuration is pretty ideal: three on the medial side (stacked along the big toe and first metatarsal, where most of your power comes from), and two laterally. At first, I was a little worried about The Wire 2 lacking the sixth spike (the last spike is usually placed on the lateral side...the whole reason I never bought the track Zoom Kennedy was because that spike stacked all the spikes along the big toe and skipped placing spikes on the lateral side, and I use my lateral forefoot enough to want spikes there). However, it turned out that I didn't even notice not having that sixth spike there (to be fair, I think the 6-spike configuration may be more of a mid-distance spike thing, with distance spikes having between four and six spikes). There is also a plastic "shark skin" over the heel for traction for heelstrikers whose initial heel contact occurs before the forefoot spikes have a chance to dig into the track, and for steeplechasers who don't always hit the water barrier perfectly, even though The Wire 2 isn't specifically designed as a steeplechase spike (steeplechase-specific spikes often have drainage holes, though I wore regular old mid-distance spikes in college and never had drainage issues, despite being the only person at Leagues without Nike Lanangs). The Brooks The Wire 2 is firm and has little cushioning, and its low-slung build places you right on top of the spike plate and close to the track. Anyone who has worn track spikes in the past knows what to expect here, though if you've only worn racing flats or XC spikes, you may be surprised by the firmness. This also means that there's not much in the way of cushion to get waterlogged. Additionally, spikes don't really offer much in the way of support, and The Wire 2 is no exception, with no additional support features or heel counter built into the shoe. At 3.8oz, Brooks The Wire 2 is super light. That's about par for an upper-level distance spike these days. Wow, spikes have gotten ridiculously light since I last bought spikes in '03. You'd be forgiven if you pick up a box of these and briefly wonder whether Brooks forgot to put shoes in the box, and this weight (or lack thereof) is obvious from the minute you put these spikes on your feet. As expected, the Brooks The Wire 2 has virtually no support. The sole doesn't offer any real arch support, and the upper doesn't have any firm structure to it. No surprises there, considering its a track spike. The Brooks The Wire 2 uses unisex sizing, so women should size 1.5 sizes. I've found them to fit true to size, or a half size larger than the Mach and T7, despite being built on a similarly curved last. The stock laces are ribbon laces that don't stay tied. Expect to either replace them or triple-knot them and thread them through the parts of the lace that cross over your instep. The Brooks The Wire 2 is a solid entry into the long-distance track spike market. Unfortunately, I don't have personal experience with the other well-regarded spikes on the market (Nike Zoom Victory, Mamba, and Matumbo, Saucony Endorphin, New Balance LD5000, Adidas adiZero Avanti and Cadence, etc), but I can say that The Wire 2 has treated me very well in everything from a 1500-5000 (minus the steeplechase) this indoor/outdoor season, and I've never felt held back by it. If I was more of a 1500-3000m runner or an athlete who ran more on my toes (and perhaps a few years younger), I'd probably favor something more aggressive, but with my focus on the 5000m, it has worked just fine. I'd recommend The Wire 2 for track athletes running the 5000-10,000m, as well as for those who favor a slightly less aggressive (but still very lightweight) spike. The Brooks The Wire 2 retails for $100 and is available on Brooks' website, as well as at many retailers that carry Brooks products. It fits true to size (if you've worn the Mach, the Mach runs small, so size down half a size for The Wire). Full disclosure: I purchased the Brooks The Wire 2 from the National Running Center with the store team discount. The opinions expressed in this review are mine and based on my experience, and do not reflect the opinions of Brooks, the National Running Center, or anyone else. Good to know that this shoe is intended for serious athletes competing in mile to 10k events. 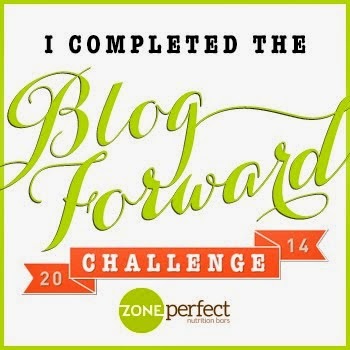 The Wire has a curved shape.